There is a 2 page Mr. T photo in the middle of the magazine where the bottom part of the pic is not attached to the staple, otherwise the magazine is in very good condition. The color is good on all the color pictures. Magazine is in VERY good shape. MAGAZINERICHARD PRYOR ON COVER. EXCEPT MINOR WEAR SIGNS IN OVERALL GOOD CONDITION. It has a tear on the back cover and 1 page is torn as well. Fantastic Piece. RIGHT ON MAGAZINE THE BEST OF PRINCE ISSUE FALL 1985 VERY GOOD CONDITION. Burda Style Magazine 6/2010 Russian Language edition, with patterns, defect on top right cover edge. Please check pics to determine the condition. Magazines will be shipped in between two sheets of thick cardboard. Burda Style Magazine 7/2010 Russian Language edition, with patterns, defect on top right cover edge. Please check the pics to determine condition of magazine. Item will be shipped in between two sheets of thick cardboard. THERE IS INDENTATION AT TOP LEFT CORNER. BOTH SPINE AND PAGES ARE INTACT. • My magazines have no label making it more valuable. • Item is well preserved aside from minor wears at the top left corner. Pages are still intact. 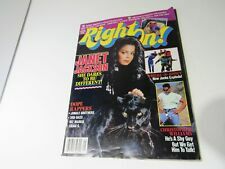 Right On🔥Magazine/2 Pac,User,Lauryn Hill,Ginuwine,Jurmaine Dupri VERY RARE Mag! The right on magazine is a very rare magazine you don’t see them around anymore. This magazine is considered rare. Over all condition is real good. 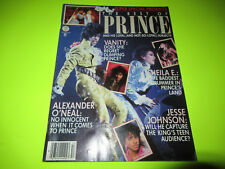 RIGHT ON MAGAZINE SUPER SPECIAL PRESENTS PRINCE ISSUE VERY GOOD CONDITION. This is an issue of Right On magazine from April 2006. The magazine features a nice cover of Beyonce. This magazine is in overall excellent condition. We are always seeking to expand our inventory. RIGHT ON MAGAZINE SUPER SPECIAL PRESENTS PRINCE ISSUE E79. Condition is Very Good. Shipped with USPS Priority Mail. December 1984. New Edition on cover. Prince article inside. Todd Bridges on cover. June 1983. Gregory Hines article also inside. Lionel Richie on cover. Diana Ross story. Andrae Crouch and a article on Moses Malone. Mar 1975 Newsweek Magazine in G/VG condition. This is an issue of Flaunt magazine Issue No. 97. This magazine is in overall very good condition. The outer covers show minor wear. We are always seeking to expand our inventory. Mar 24 1975 Newsweek Magazine in EX condition. For sale is a Right On! The other side of the magazine features Pretty Ricky. All pages present and intact. Normal wear for magazines of this age. Fashion trends and cultural events. The Atlantic 11-62. Magazine is in very good condition. The Leaders: Randolph and Rustin. September 6, 1963 Life Magazine. Vintage jet magazine June. 24,1965 Negroes Strike For Rights On Miss. Plantation. Condition is Good. Shipped with USPS First Class Package. This listing is for a Dec. 12, 1969 Life Magazine with cover story & photographs of Apollo 12 on the Moon. Also articles on Women's Rights & College Campuses. Cool Mid-Century Ads. Condition: Complete issue with 96 pages. Overall, very good condition - intact. No writing. Label on front cover. Shows minor edge, cover, & corner wear. Check my listings for more magazines & other unusual items! Shipping Weight: 2 pounds US Shipping: We pack defensively with lots of packing materials. Buyer to pay USPS Shipping from zip code 92027. We reserve the right to change shipping method. NOTE: Any magazine with advertising may not be shipped via USPS Media Mail. Jenna Dewan ~ Moves On, Swipes Right. January 2019. Your 2019 Ex Dating Strategy. Cosmopolitan Magazine. Removable protective front cover. I try to live life in an eco-friendly way. December 12,1969. A magazine that is complete but flawed. May have minor imperfections on the front or back cover or no more than 20-39% of the magazine in total, (imperfections being; tears, stains, creases, folded corners, loose pages/covers or writing). Southern Fireside magazine October 1949 2nd issue article on states rights. Front of magazine is bright and clear of defects except for a slight tear around one staple. Overall better than good shape especially to be 67 years old. Ads are especially interesting! BRIDES magazine is the biggest, most well-known, and most read magazine of its kind. It's a must for the bride-to-be! In addition, each issue includes loads of advice and do's and don't's on most aspects of planning and conducting a wedding and reception without going nuts.